AWAY: Journey to the Unexpected is coming out tomorrow on PlayStation 4, with Nintendo Switch, Xbox One and PC releases due briefly afterward. 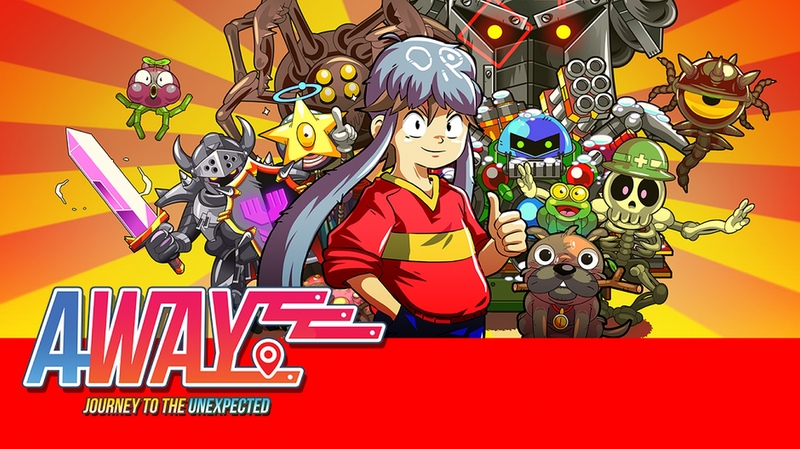 A ‘feel-good FPS’ made by an indie two-man team and due to be published by Playdius and Plug In Digital, AWAY: Journey to the Unexpected is a colorful adventure with action and rogue-like elements set in a 3D world with 2D characters. The result is a strikingly unique visual style. We talked to Aurelien Regard, who previously released the fast-paced top-down action racing game The Next Penelope, ahead of the launch of AWAY: Journey to the Unexpected. Enjoy! How many developers are working on AWAY: Journey to the Unexpected? The game has primarily been a 2 person project – just 2 graphic artists wanting to learn how to code, really! Once the PC beta milestone was achieved, we’ve been more than relieved to be helped by Seaven Studio, the guys who helped us with the ports, transforming our clunky, buggy version into a real, working multiplatform game. This is a very different game than The Next Penelope. Why did you choose to make this project now? Why did you pick Unity over Unreal Engine 4 and what was your experience with it? I picked Unity in the most straightforward way possible: launched it for the first time, liked it, kept going with it! Being a beginner when it comes to coding, most of the troubles we encountered are directly linked to my lack of knowledge, not the software itself : ) That said, this was 3 years ago now – I’ll definitely have a closer look at Unreal Engine 4 in the future, as it looks fantastic. How long do you expect the game to be, based on playtesting? Is it very replayable? It can vary pretty wildly, it could be anything from 4-12 hours, depending on your skills and how much you like to search for secrets. Some parts of the game have a lot of random elements (see below). What can you tell us about the story of the game? Are you aiming this squarely at younger people? The game is about kid stuff but should appeal to kids and grownups – kind of a lighthearted shot of energy into your sometimes too serious everyday adult life! You play as a kid who is pretty bad at fighting, he’s not a hero, and will never be one. But he’s pretty good at making (powerful and weird) friends, so you’ll be in danger but rely on that. His parents are doing a secret job he’s not allowed to know about. Being the curious kid he is, of course he very wants to know more. There is no drama or sad stories behind this secret, only silly characters and situations! Is the setting sci-fi or a mix of genres? You mentioned rogue-lite elements in your press release. Can you go into the specifics? Sure! Each time you’re entering a fighting portion of the game, we made a lot of handcrafted levels, and randomly pick one of them. The game is not procedurally generated, so we can keep for sure the control about what you see, but at the same time we’re trying to keep the combat fresh for each run. At the beginning of the game, and any time you die, you’ll restart from your home. But soon you’ll unlock shortcuts. And of course you’ll keep your money and important stuff between your games, so you’re not losing key progress. How will the players recruit allies to their side? By playing your cards right during dialogs, and using multiple answers. Most of the time you’re simply trying to make a new friend, but sometimes you’ll have to adapt to…unusual logic. For example, how will you convince a super pissed off tree to join you? Or a robot? Or a talking, invincible animal? Did you consider having multiplayer at all in AWAY: Journey to the Unexpected? Nope, AWAY is a single player experience only, and has been designed this way from the beginning. Will AWAY: Journey to the Unexpected definitely launch within the first quarter of this year on all platforms? All versions are now approved by the manufacturers, so I’m happy to say YES! It will launch on first on PS4 (5th Feb), then Nintendo Switch (7th Feb), Xbox One (8th Feb), and PC on 13th Feb.
From a technical standpoint, could you outline the specs of each version (PlayStation 4 Pro, Xbox One X, Nintendo Switch and a high-end PC)? Seaven Studio could answer this question in a more specific way, they made the ports, not me. But last time I checked, the Switch version ran at a stable 30fps and the other versions at 60. Also, the more powerful the platform, the more resolution, draw distance and details. That said, I’m pretty happy about how it looks even on lower powered hardware, this was super important to me. They did a very nice job at having the same global experience across all platforms, so kudos to them for their hard work!